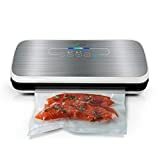 The Crenova VS100S Upgraded is our pick for the best vacuum sealer, which has a seal indicator light, a sealing strip measuring 3 mm, has a manual pulse function for a better sealing technique, comes with free plastic bags of different sizes and is made with a durable stainless steel construction. Our step-up pick is the FoodSaver 2-in-1 v4840 and this one also comes with free zipper bags and seal bags, plus various settings for different kinds of food items. It has a drip tray that is dishwasher-safe and this can allow it to handle even marinated meats with less fuss and cleanup needed. The budget pick is the FoodSaver GameSaver Outdoorsman and this one does not easily overheat, allowing you to make up to 40 seals consecutively. It seals any food item or object thoroughly without leaks and it also comes with bags and other accessories. A common food preservation method would be mason jars. Most food items can easily spoil if we don’t put them in the right container, such as meat, fish and veggies. Fresh food items are very delicious, but only until they are expired or delayed in terms of storage and cooking. If you don’t cook them right away, they become a breeding ground for bacteria and the like. Without preservatives, naturally obtained food such as fruits, veggies and some meat products can be easily spoiled, especially in highly humid areas. Running a fridge just to preserve food can cost electricity. We can’t always put them in the fridge, especially if we are going to be out of the house. This is because we can sometimes be too busy to keep things in the fridge, or we are forced to turn off the fridge if we are going on a long vacation. You wouldn’t want to waste a week of your fridge running just to keep your ham and veggies safe and sound – so you have no choice but to turn it off to save electricity but sacrifice the food item in return. This can be the most frustrating choice you need to make in the kitchen, if this is the case. Therefore, you need something that is going to resolve this problem without costing too much electricity. A good way to keep ingredients totally fresh and preserved is to vacuum seal them. Vacuum sealing helps keep away all the air and moisture, and therefore, keeping the bacteria away from your food. Bacteria can cause your food to spoil and get bad, and this is why if you remove the air and moisture on the food, it will remain fresher for longer. This is why your bag of chips or other packed food items have been vacuum sealed to protect them from spoilage. It is an industry standard and can be a useful kitchen tool at home or in a store. Interestingly, vacuum sealers look like printers but are handy kitchen appliances. They have a wide design and they are also similar to a laminator machine, if you have seen one. Instead of laminating paper and documents, they “laminate” food items, such as your bag of potatoes, vegetables, meat and the like. For the vacuum sealer to work, you need bag rolls. These bag rolls are widely available worldwide in most local grocery stores. However, you need to be sure that the bag roll you buy will fit just fine in the vacuum sealer that you intend to use it on, to avoid wasting money and having an ineffective seal. Restaurant meat can be kept fresh with a food saver to vacuum food. You can definitely use this method whether for home use or for commercial stocking of food items. For home use, it can be a great way of stocking up on food for the winter or for emergency purposes. For commercial purposes, you can use it for restaurants or fast food, or basically anywhere where food preparation is involved. Vacuum sealing is also great for those who prepare meat in the sous vide method. Size or width: this is important so that you will know what size of plastic bag is needed. The size can depend on what plastic bags you intend to use it with, and how big your kitchen countertop space is. Consider one that meets your requirements and can also fit the amount of food that you intend to put into the sealed bag(s). Ease of navigation on settings: an easy to use vacuum sealer can be a hassle-free way to seal your items in the kitchen. Just like a printer, you should be able to navigate through the settings very well and the buttons should be easy and intuitive for most users. 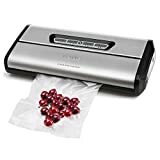 Included plastic bags: you can also count on a good vacuum sealer that already includes plastic bags for convenience, so that you don’t have to buy a set of plastic bags. These bags should be in the right size for your food items as well, and they should easily fit in the unit without putting some air bubbles on it. The food vacuum sealer should be easy to clean. Ease of cleaning: aside from the ability to seal your food items, it should be easy to clean as a kitchen appliance or equipment because it can get dirty because of the food. The unit should be a breeze to wipe off excess bread crumbs, fruit splashes and the like. Durability: for long term use, you should consider one that is highly durable in terms of materials used for the housing and the inner workings of the sealing unit. A durable one is good for the many years to come, so that you can easily carry over your investments for the unit itself. They should have a good chamber sealer for liquids, regardless of model. 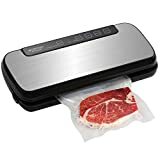 Ideal food items: while all vacuum sealers are intended for nearly all food items, there are ones that are specifically ideal for certain food items, such as meat or vegetables. Some will work well on dry foods, liquids and those needing an air-tight seal to preserve shelf life. 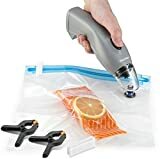 Safety features: to make sure that your fingers don’t get sucked in, the model of the chamber sealer should have protective features when it comes down to sealing your food items in the plastic. The Crenova VS100S Upgraded is our top pick for the best vacuum sealer, which is made with a stainless steel construction to make it more durable and longer lasting, while it keeps food fresh when you perform sealing on your items there. Because it is easy to clean due to the design, you will spend less time in the kitchen and more for other things. It includes a total of 10 bags, with two sizes of bags (22 x 30 cm and 22 x 10cm) for your convenience, depending on the amount or size of food item you have in mind. It has a 3 mm wide sealing strip to make it easier for you to have great control without leaking air bubbles in any of your sealed food items or bags. It can help retain nutrients and vitamins in your food items by sealing. It also has a metal case as part of the stainless steel construction so that it can be durable in the long run. This unit works well if you have cube steaks, salads and similar food items. There is also a seal indicator light so that you will know when the unit is working properly. The maximum width of bag that you can use in this machine is at 28 cm, so it is easy to find a bag for it. To help you operate the unit properly and safely, there are plastic stops that you can use as a guide. It is also greatly compatible with any sealing bags of any brand so you don’t have to worry about looking for an appropriate bag for it. This unit can seal items and make them last up to 8 times longer than regular storage – perfect for delicate foods. The only minor con of the Crenova VS100S Upgraded is that it takes practice to align the sealing bag to make sure that the food or item is properly sealed, which takes trial and error, anyway. The FoodSaver 2-in-1 v4840is our step-up pick, which has a drip tray drawer you can pull out for ease of cleaning in the dishwasher. This makes the cleaning process much easier and less of a hassle in the long run. It can take care of your pantry items much easily without potential leaks in the bag. The unit is also BPA free so it will not leak out harsh chemicals in your food item. The package set includes 3 heat seal bags, 3 zipper bags, 2 larger heat seal bags, 2 larger zipper bags and 1 roll of plastic bags at 11 inches x 10 feet in total length. You can process marinated food and start to marinate in minutes instead of going for hours and hours of spending time with your meat products. It also has the option to change the humidity based on the food – dry and moist settings are available. The multi-layer material heat seals easily and effectively with less room for failure, despite the fact that you haven’t used a vacuum sealer yet. The max width of bag is about 11 7/16 inches so it is pretty good with a majority of bag sizes out there. It also has a roll storage for convenience and can handle delicate items like fruits, while keeping freezer burn at bay. It also has a bag cutter to make life easier when sealing. Intended for game hunting and fishing, the FoodSaver GameSaver Outdoorsman is our budget pick, which is ideal for the kitchen of most campers and RVs out there. It can perform airtight sealing for up to 40 consecutive seals without overheating, which is important if you are in the wilderness and are hunting for game and fish, as well as small game birds on the go. It can also handle general grocery meat as an everyday vacuum sealer. It is made with a heavy-duty construction so that you can enjoy its usage and function for many years to come, despite being used outdoors. It also has a portable design so that you can take it with you alongside rivers and into the woods without easily cracking down. It allows you to effectively seal and preserve meat, fish, and poultry, so that you can make fish fillets in a breeze without freezer burn. Great for outdoor enthusiasts, the FoodSaver GameSaver Deluxe is quite versatile and it even includes a bag roll of 11 inches x 10 feet for you to use readily. It also has a lock latch closure to make sure that the sealing process is smooth. It also seals up to 120 lbs of game in one go and can make your game or food item last up to 5x longer. Like most FoodSaver models, the unit comes with 5 heat seal bags (1 quart each), 5 heat seal bags (1 gallon each) and a hose for vacuum containers, but you can also use any common bag sizes for it. There is also a removable drip tray for you to catch the grease and the meat or fish juices. If you want a vacuum sealer that is fully automatic, the NutriChef Sealing System is a good starter for you. It has LED indicator lights that allow you to see and check if the unit is functioning properly. The fact that it is fully automatic makes it easier for you to save time and effort in the process, especially if you work on a busy kitchen. This unit allows you to work on two sealing modes: dry and moist, depending on the type of food that you have, whether it is solid or poached. It also gives you a one touch operation, which is helpful to save time and learning curves for people who don’t have the luxury of time to do so. Like most sealing units out there, it can help to preserve food up to 5 times longer to keep your food fresh for preparation. Bearing a sleek design, it can also process most soup based food so that you can store it with great freshness. It comes along with waterproof air-sealing bags so that you can be able to take it with you to camping and backpacking. If you are running a small business then this unit can be of great use to you. It is stain-resistant so that it is easier to clean. You can use it for many leftovers in the freezer and the housing is easy to wipe off excess food crumbs, too. 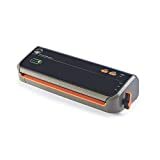 If you want a unit that has clear LED indicator lights to make sure you know that it is working properly, the GERYON Vacuum Sealer is a good choice for you. Its housing is made with ABS plastic so it is lightweight but still durable. This durability and lightweight design makes it so you can take it with you on a picnic or camper, or even on an RV or trailer home. It has soft touch digital buttons that are easy to use and to learn how to configure the settings on. It has both dry & moist mode settings so that you can work on different kinds of food in just one machine. There is also an accessory port and hose for wine and canisters for those who need it. The unit can allow you to seal and store different types of food and keep them fresh for a long time. It even works on household items if there is a need to do so. Handling and maintaining this unit is simple because it is easy to clean with a damp cloth or paper towel. It can take up to 12-inch wide bags so it is pretty good for most bag sizes. In fact, beginners can use this easily due to the intuitive controls. It can take about 6 to 10 seconds of sealing time and 10 to 20 seconds of vacuum sealing time. The pack includes 5 heat seal bags at 7 x 11 inches each for you to use right away, and it also comes with a roll of 7 x 7 inches. The unit is coupled with a 3.3-foot power cord, making it easy to store. The unit is backed by a lifetime warranty as well. If you are into sous vide cooking preparations, you can count on the Gourmia GVS425 to do that job for you. This sealing unit can potentially save money, whether you are a business owner or just processing items at home, such as leftovers or bags of steak. It has dry, moist, soft or delicate settings for you to choose from. These multiple settings help you go with the type of food that you’re storing. You can even process items like trail mix so that you can pack it in a bag for future trips outdoors while keeping your food fresh. It also has LED indicators for you to be able to tell when the unit is working properly. It can also process items like cookies and pastry due to its accommodation of delicate goods. Bearing a powerful motor and pump, it is TUV certified for safety so you don’t have to worry a lot about its inner workings. It is also less likely to make a mess as a vacuum sealer due to this fact, and it also has a sleek design to fit into most countertops. It includes a bag roll set (22 x 30 cm and 28 x 40 cm) as a starter for you to use. If your focus is mainly on steak and meat sealing, the Crenova V60 Plus is a great consideration for you. It supports up to 11 inches or 30 cm of bag width so it is pretty okay for most sizes of bags, which is good for simple cuts or cubes of meat. It keeps food fresh up to 7 times longer due to its sealing capabilities and you have the option to switch between dry and moist mode as well, depending on the type of food you have. There is also a manual button for a pulse function depending on how delicate your food item is. There are also LED lights to let you know if the unit is working properly. The sealing unit is quite easy to store on most shelf heights. It can also handle seasonal foods as well as fish, which is essentially important if you are going on a long trip or if you want to preserve them for certain parties. It can also be useful for making crispy chips and processing bulk food items while retaining their flavor and nutrition with less likelihood of fast spoilage. It works well tender meat overall and can be better than your regular freezer bags if you use it properly. There is also a built-in cutter for bags so that you can easily it in most bag sizes there. It can handle fruits and store leftovers in a breeze and can work well for most sous vide preparations. It also has an accessory pipe for VAC sealing systems and it has a 1-year free replacement or refund warranty. If you want something that is of commercial-grade, the Weston Pro-2300 65-0201 can be a great choice for you. It has easy to see LED lights to make sure you know that it is running properly. It can withstand repetitive use without having to cool down, as it can seal 50-60 bags without overheating, making it truly ideal for restaurant or food shop use. It has a double piston pump that makes it ideal for such commercial activity, which allows you to seal up items on the go and at a faster pace. It is also made with stainless steel material so it has good durability, and it also has an automatic mode for ease of use for people who have little time at hand. It can process leftovers and even delicate foods due to the manual function. This unit keeps food fresh 5 to 6 times longer than regular freezer bags with proper use. It can also accommodate bags up to 15 inches wide so it is great for most bag sizes out there. In less than 5 seconds, you can have a properly sealed food item. Like we mentioned, it has a manual control option for delicate food items. Bearing 935 watts of power on its motor, it is quite a powerful contender and is easy to keep clean. This commercial-grade unit is backed by a 2-year manufacturer’s warranty. Bearing a portable design, the EIVOTOR Automatic Mini is a great choice for home use as well as for camping and backpacking. It has both a dry and a wet mode depending on the type of food that you have on your fridge. It comes with a pack of 20 fresh bags that are ready to use. The unit also passed FDA standards for safety and protection, while it definitely works on most food items like fish fillets, meat, fruits and a couple of veggies as well. It only requires a cool down time of 2 minutes after each seal. It is rated at 90 watts of power and is made with ABS material for the outer housing. For home use, the Aicok Vacuum Sealer is a good starter because of the simple yet effective design. It can process fruits, vegetables, meat, fish and even delicate items with the dry and moist settings. It can work with a majority of bag sizes out there and it has a flat, compact design – perfect for low shelf storage. This unit comes with a pack of 10 vacuum sealer bags in two sizes: 8 x 12 inches and 11 x 16 inches. You can definitely find it ideal for sous vide preparation for meat, and it can also be used for delicate items due to the pulse or manual function. It prevents freezer burn for most food items and is also lightweight to carry with you to most campers and RVs. There were others that were not cut out for the competition because they were not working properly, were too bulky to place on most kitchen countertops, and were also not very durable. It pays to have one that is durable because these sealing units don’t really come cheap – they are much like printers in terms of price (and in looks). Q: What factors should you know about before you choose a good vacuum sealer? Amount of food You should know whether your sealing unit is ideal for the amount of food you intend to put on the bag and seal to preserve. You should consider a bigger vacuum sealer in terms of width if you intend to process larger amounts of food in one go. 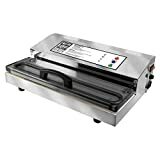 Commercial or home use There is a big difference with a vacuum sealer that is meant for home use and one that is meant for commercial restaurants. A vacuum sealer that is meant for the commercial kitchen will have less cooling time needed, meaning you can seal consecutively without the unit overheating. Price range If you compare the price of a printer (which the vacuum sealer looks like), they are pretty much the same, and some are even pricier. 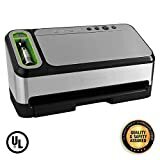 This is why you should know about your budget first if you can afford the vacuum sealer and if it is really your priority for your food preparation needs. Countertop space We all know that a vacuum sealer can take a lot of space in the kitchen, so you should know where you will place it and how big or small that space will be in terms of length, width and height. 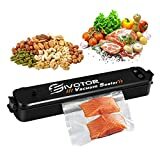 Effectiveness of sealing Ask around people who have owned or tried this vacuum sealer – is it worth the cash? Is it very effective? Does it form bubbles or does it seal properly? While it is true that sealing is a trial and error process at first, you should find one that is totally effective in sealing when done properly. Q: What is the maximum temperature that a sealed bag should be placed on? A: If you are a sous vide chef or cook, you should keep the temperature of the water only up to 175 degrees Fahrenheit, just to be safe. Most plastic bags are not designed to withstand harsh temperatures so you should keep them safe and not leak out chemicals from plastic materials. Q: What items can you use a vacuum sealer for? Frozen chicken parts can be kept in vacuum bags. Poultry This includes chicken, turkey and other game. Seafood This includes fish and other edible seafood. Meat This includes beef, pork, lamb and the like. Small food items This includes snack foods, candies, nuts and grains. Non-food items This includes backpacking supplies, office supplies, important documents and the like, so that they won’t get wet when backpacking. Q: What is the sous vide method? A: Sous vide translates to “under vacuum” when translated from French. It is a way of food preparation which involves vacuum sealing a food item, such as meat products. Sous vide is done with the means of a vacuum sealer and a hot water bath for the food item in the precise temperature. Sous vide is mostly done in high class and fancy restaurants, but nowadays, many local chefs are experimenting on it as well. Q: What are the benefits of the sous vide method? Cooking meat in the sous vide method can have benefits. You get more flavors out of your cooked meat product. The meat will never get overcooked in this process. It can produce perfect results nearly every single time. The texture of the meat product is more tender. You can get a healthier finished recipe with the sous vide method. Q: Who can do or use the sous vide cooking method? Most chefs have initiated the sous vide method. Q: What are the benefits of a vacuum sealer for a hunter? Game hunters can benefit from a vacuum seal machine starter kit. Keep their game fresh for a long time A good way to preserve the duck, goose, turkey or any fowl or game bird that can be hunted in the woods would be putting them in a vacuum sealer. This can retain their freshness until it is time to cook. The same method applies to fishermen and those who fish for a living or as a hobby. Less likelihood of contamination Because your food item is totally sealed in the bags, you will less likely have to worry about food contamination because there is no moisture in the surrounding area of the food item, making it less likely to spoil easily. Stock up on food supplies for long journeys If you plan to camp out and hunt for days upon days, you should definitely stock up on food. One of the best ways to do so is to use a vacuum sealer to preserve anything you have hunted down or any kind of food in your inventory. Q: How is an airtight sealed container different from a vacuum sealed bag? Total space or portability Airtight containers take up more space in the kitchen or in the fridge. Sealed bags take up less space so they are easily packable not just in the kitchen, but also in a camping or backpacking trip. Process Airtight sealed containers are simple – you just put the food there and it will preserve the food item, locking away moisture from the outside. Sealed bags require a vacuum sealer for you to properly seal. Effectiveness in keeping food fresh Airtight sealed containers don’t always work properly – especially if they are older models or if you have used them for a very long time already. Sealed bags work more effectively because they are thoroughly sealed using a machine unit. Q: Can an air purifier help preserve my food items? The dreaded mold can cause food spoilage. A: An air purifier can help eliminate mold, which causes food spoilage. This is also an important thing to have at home if your humidity is very high and mold is likely to appear. Therefore, if your kitchen space is mostly a moldy area, you should definitely have the best air purifier around to keep mold at bay. Q: What signs should I avoid when selecting meat products? Q: What is the moist and dry setting for in the sealing unit? A: The sealing unit has a moist and dry setting so that you can adjust according to what food item you have. You should consider if your food is dry or liquid in substance and choose the right setting so that your food item is sealed properly. Q: Which materials are okay to use in a vacuum sealer? Most plastics This includes nylon, polypropylene and polyethylene. Certain paper products This includes craft paper and the variant with a plastic lining. Foil There are certain foil types that are okay for heat sealing. Q: Can a dehumidifier also help me preserve my food items? A: Just like how an air purifier can keep mold away, a dehumidifier can also do the same. Dehumidifiers keep the humidity to a minimum so that mold will not have a chance or less likelihood of a chance to grow and spread, keeping your food items safe and sound. This is important for highly humid areas around the world, in terms of food safety. Q: Can I use any bag or plastic in this sealing unit? A: Check with your manufacturer first, as to whether it accepts all kinds of bags and plastic bags, or if it only uses the included bags in the unit itself. Usually, there are specific sealing bags that are intended for this sealing unit, by which you can buy at a local grocery store. Q: What are some common meat preservation methods? Freezing The simple way putting your meat into the freezer. Freeze drying The meat is put in a vacuum sealer then tossed into the freezer or fridge. Dehydrating This is simply drying your meat into the sun. Curing Curing is rubbing salt and spices onto the meat to keep it fresh for hours. Canning It is simply the method of putting your meat products in a sealed can. Keeping the livestock alive Basically, if you don’t have to cook it yet, you can just keep your livestock alive until needed. Q: Can a vacuum sealer prevent freezer burn? A: Yes! Freezer burn can be prevented with the use of a vacuum sealer because of its ability to keep moisture away from your food, causing the food to be in a state where it is undisturbed by the change in temperatures outside of the bag. Q: Can I put dog kibble in a vacuum sealer bag? Dog kibble can be placed in a vacuum sealing or food sealer machine. A: Yes! Dog kibble can definitely spoil if you don’t store them properly. Pets can get sick if you feed them spoiled food, and this is why you also need to store their kibble in the right place. The means of using a vacuum sealer bag is a good way to preserve Fido’s treats. Q: Can I also preserve meat using a smoker? Meat This includes chicken, turkey, gamefowl, pork, ribs, mutton, beef and many others. Seafood This may include fish, lobsters, crab, shells, oysters, and the like. Fruits and vegetables While not a very traditional thing to do, there are some ways to put fruits and vegetables in a smoker to preserve them as well. Q: Can food steamers be used for preserving food? A: Yes, many food steamers are currently being used in the same way as a smoker would be used – to preserve food. Alongside your vacuum sealer, you can also use a food steamer as an alternative to keep the ideal temperature of your newly cooked dumplings and preserve them. Q: How can vacuum sealers save money? A: This kind of sealing unit can save money by preserving your food items for months, eliminating the need to shop often. This also means that you have more supply, if you are a business owner, and you don’t need to work as hard as to gather new food supplies because of the food preservation method. As a whole, the Crenova VS100S Upgraded is our pick for the best vacuum sealer, due to the indicator light, free plastic bags, pulse function for vacuum sealing, 3 mm wide sealing strip and durable stainless steel construction.